Are you looking for a different flavor combination for your next ham? 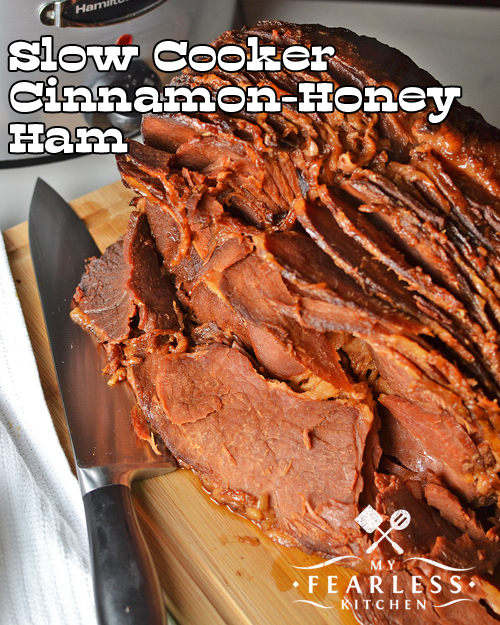 This Slow Cooker Cinnamon-Honey Ham is easy to make, and stays moist and delicious! Ham by itself is very flavorful. But you can add even more flavor with a few more ingredients. Most hams come with a glaze or spice packet. You can use those, but I like to mix my own. And this Cinnamon-Honey combination is a winner! A long soak in brown sugar and cinnamon will turn your ham a little darker color. Don’t worry about it – it still tastes delicious! Even though ham is one of the easiest things to cook (most of them are pre-cooked and only need to be heated), ham is also one of the easiest things to mess up. If you leave it in the slow cooker or the oven too long, it can get dried out. Nobody likes dry ham. So the trick is to use a meat thermometer. Every time. I use a probe thermometer like this one so I can monitor the temperature the entire time the ham is cooking. Pre-cooked, ready-to-eat ham should be reheated to 140 degrees F. For a 9-11 pound ham, this should take 3-5 hours on low in a slow cooker. 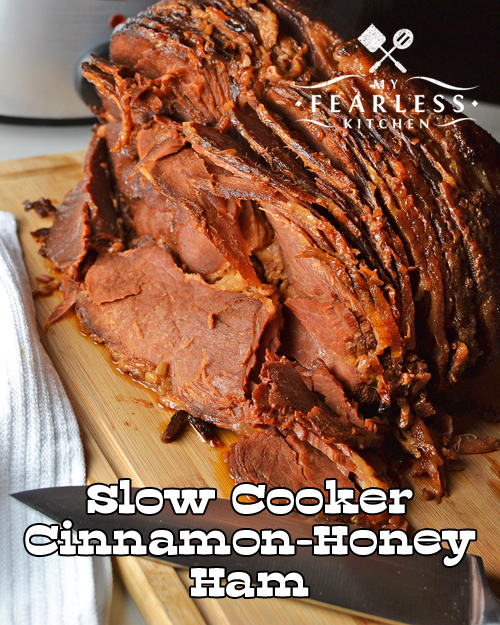 Be sure you know how big your slow cooker is before you pick out your ham! I have a Hamilton Beach 6-quart slow cooker and a Crock-Pot 6-quart slow cooker. The Hamilton Beach model is a longer and thinner oval shape. The Crock-Pot model is more round. Most hams fit better in my Crock-Pot slow cooker. Take a few measurements of your slow cooker, and bring a flexible tape measure with you to the grocery store. You might feel silly, but it will save you a lot of trouble! 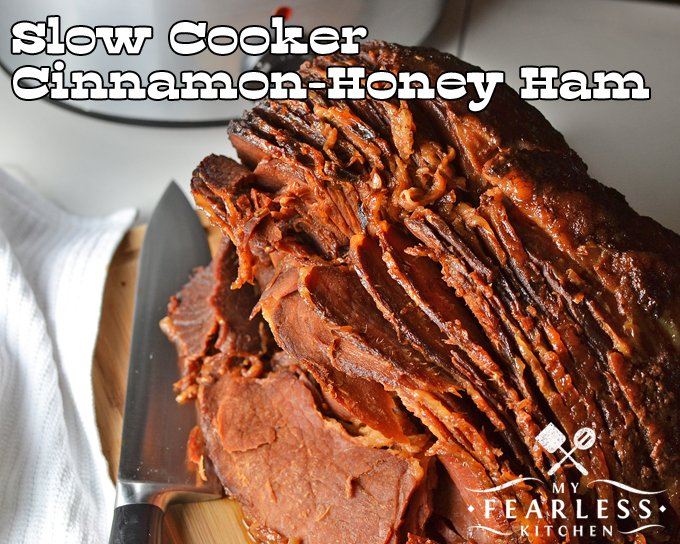 I have been known to peel a few slices off the end of a ham to get it to fit in my slow cooker before, so don’t worry if that happens to you! Place ham in a large 6-8 quart slow cooker, cut side down. (Remove a few slices from the cut end of the ham if necessary to fit.) Transfer as much liquid from the ham packaging to the slow cooker as possible. Pour the brown sugar mixture over the ham, packing it down to form a crust on the top of the ham. Drizzle the honey over the top of the ham. Remove from slow cooker and let rest for 5 minutes before carving.